I Thought I was a Smith: George gets to Canada, at last! 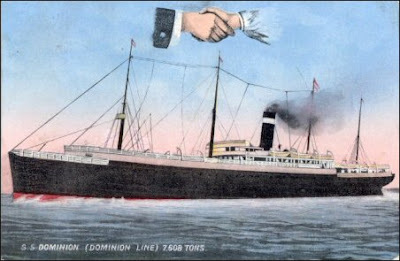 When we last saw George Cockram in June 1875, he was boarding the SS Dominion in Liverpool to head for Canada, using the name Thomas Smith - and I'm sorry to say I still can't shed any light on why he did that. So I'll just pick up his story where I left off. The cost of the journey across the sea would have been out of many people's reach at about £5 to £6 in steerage (it's very difficult to find accurate information about that (1) so I'm estimating, based on what I could find.) As a labourer, it could take him two months or more to earn that much. But Canada offered 'assisted passage' to many people who had the skills the country wanted. In this 1883 Allan Line ad, they're listed as mechanics, navvies, agricultural and general labourers, and their families, and female domestic servants. I don't know if George was able to afford his passage or not - but his marriage record says he was a 'labourer', which certainly suggests that he could have been in a position to get 'assisted passage' to Canada, for which he might have only paid one pound. George may have been helped in other ways too. For example, if he knew someone in Canada who could 'take him by the hand' for a short while when he arrived, and help him get work. Uncle George is a possibility in this regard, but I don't know what part of Ontario he was in when his nephew arrived there, and he might well have already settled in St Thomas, where young George probably never went. But George might well have had a friend who went to Canada before him (or for that matter, with him) about whom I know nothing. 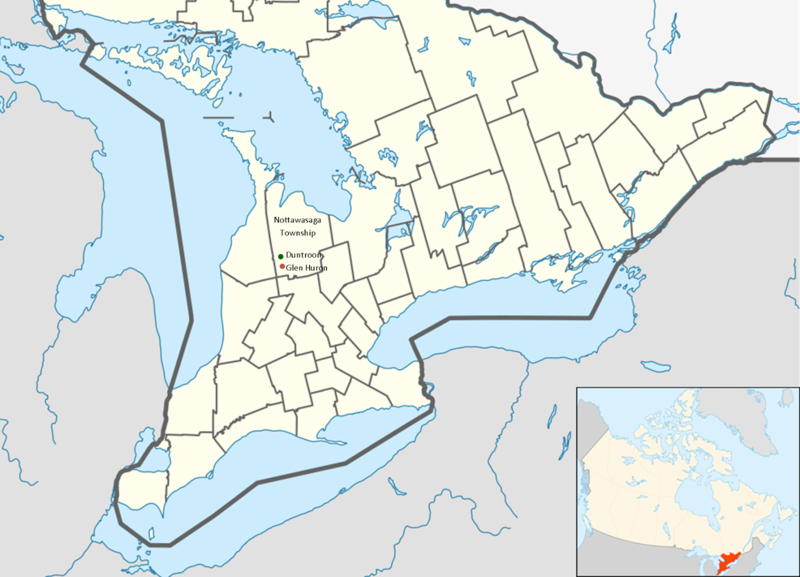 As far as I know (and that's not very far) George spent his first year or so in Canada in Singhampton, Nottawasaga Township, Simcoe County, in southeast Ontario, about 500 miles west of Ottawa, which by the way is listed as his intended destination on the ship's passenger list. This could mean that he had booked a rail journey from his arrival point in Quebec, to Ottawa - then again, it could mean that when asked where he was headed, he named the only city in Ontario that he knew. 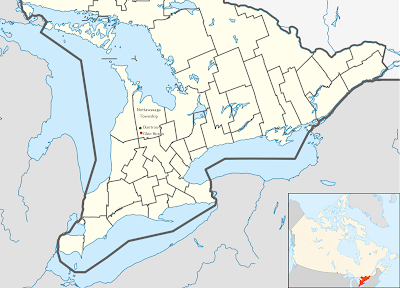 But George obviously liked his life in Canada, and once he had brought Louisa and Clara to Ontario in 1876, he settled his small family near Duntroon in Nottawasaga, where he was most likely growing wheat. In 1877, Louisa's mother Jane left England and joined the family in Canada. She spent the rest of her life there, apparently living sometimes with George and Louisa and sometimes with her other daughter, who I like to call Jane Jr. You might recall that Jane Jr has been bothering me for some time, her whereabouts after 1871 unknown. But according to my cousin Donna, who heard it from one or two of our great-aunts, Jane Jr emigrated to Ontario too. I can't find her there, mainly because I don't know who she married, but I'm assuming it's true. Anyway, George and Louisa had another daughter, Annie (Maud), in 1877, followed by George Jr in 1881 and Fred (Will) in 1883. 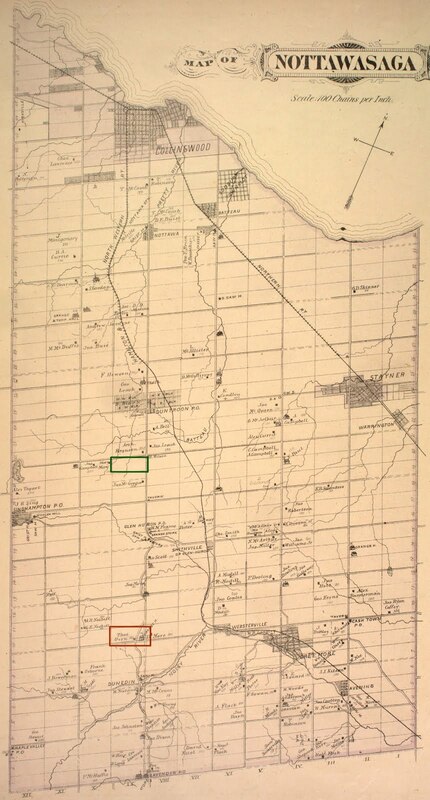 The family was still at Duntroon in 1884, when George was listed (as Thomas Smith) in the 1884 Simcoe Gazetteer as a tenant farmer at Con 9 Lot 21 (marked in green on the map below). Another daughter, Bessie Jane, was born in 1885, and then the family moved a few miles south to Con 9 Lot 10 near Glen Huron (also known as Smithville - is that significant, I wonder...) where Elizabeth (Grace) was born in September 1886. On the 1881 map below, their 200 acre farm (marked in red), is shown to belong to Thomas Ovens. I haven't been able to discover whether George rented or owned this farm. 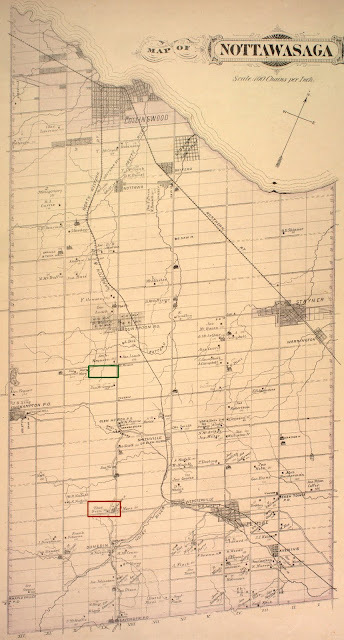 George's first farm, at Con 9 Lot 21, marked in green. His second farm, at Con 9 Lot 10, marked in red. At Glen Huron, three more more children were born - Walter in 1889, who died two years later, my grandfather Herman (Ryley) in 1891 and Prudence in 1893. Then in 1894, the family moved to Saskatchewan - but that's another story. 2) Personal correspondence from the Canadian Immigration Museum. See my previous post here.